CWA, our Legislative Political Action Teams in every district and our progressive allies are fighting back against the flood of corporate dollars that is destroying our democratic process. House Democrats have been working together to create a single piece of legislation to combat the epidemic of big money in politics. The Government By the People Act, H.R. 20 was introduced by Congressman John Sarbanes (D, MD-3) with over 130 cosponsors. The bill would increase the power of small contributions that regular Americans can afford to give and therefore incentivize candidates to reach out to every-day people. Creates People PACs, or small donor committees, that aggregate the voices and power of ordinary citizens rather than wealthy donors (as traditional PACs tend to do). McCutcheon v. Federal Election Commission was recently decided before the Supreme Court and many are calling it the next Citizens United. In a 5-4 decision, the Court eliminated the aggregate contribution limit individuals can make to political parties and campaigns. The individual per-campaign limit is still intact – for now – but the march to 1% control of our government has been greatly advanced. Citizens United opened the door for unlimited independent expenditures by corporations and now McCutcheon has opened the floodgates for the wealthy to directly bankroll the candidates of their choosing. We are not alone in this fight to stamp out big money in politics, but we have to spread the word far and wide. So many around the country feel disenfranchised by our current system and the vast majority of Americans feel the same way; 7 in 10 Americans favor campaign finance reform. By educating others of their ability to influence their democracy we can make a difference and this legislation is one major step. 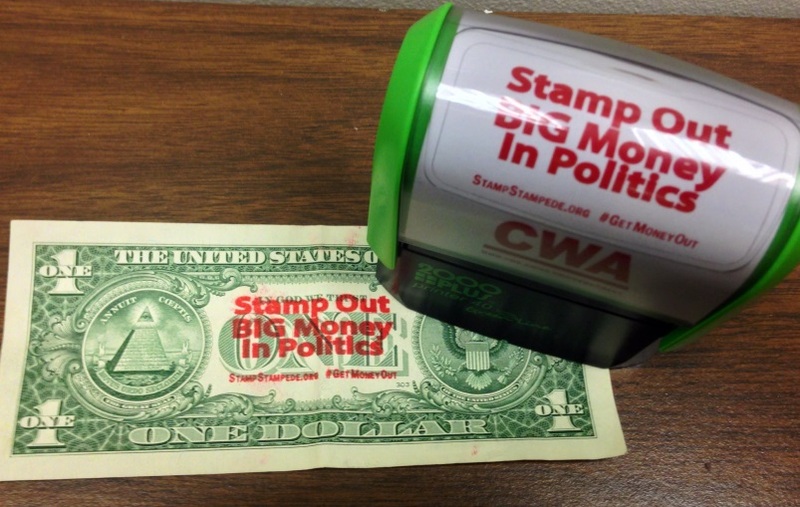 CWA members can order our Stamp Out Big Money in Politics stampers through their LPAT coordinator. It’s perfectly legal and a fun way to spread the word.